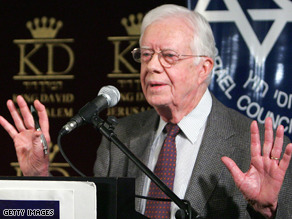 Carter says a joint Obama-Clinton ticket is unlikely. (CNN) - Hillary Clinton would accept the No. 2 spot on the Democratic ticket, but it's highly unlikely Barack Obama will offer it to her should he be the party's nominee, former President Jimmy Carter said Tuesday. Speaking during a question and answer session at an event in Houston Tuesday night, Carter said, in his view, it's not impossible the two could pair up for the general election. But the former president said Obama will most likely search for a different vice presidential candidate. "But I think if he asked her, she would take it," Carter added. The former president also reiterated that he does not have direct contact with either campaign and is not privy to the VP deliberations. "That would be the ticket the republicans would favor I think," he said. Carter, a Democratic superdelegate, has yet to formally endorse a candidate, but he has strongly hinted he is in favor of Obama. It would be great to see everyone move forward from this so-called "dream ticket". It's not going to happen, so move on already!!! The Clinton Family will do just about anything to save their face in their predicament. If HRC does not get the nomination to Obama, Bill and Hillary will lose their political clout in the US and around the world. Bill will get less speaking engagements, less donation to his foundations, less money from lobbyists, etc. etc. Hillary probably will not get re-elected as a NY senator since she only used NY as a convenient stepping stone to prepare for her presidential ambition. Bill and Hillary are probably preparing to make Chelsea the first woman president that Hillary wanted to be but could not be. The Clinton Family is all about making a legacy for themselves. We're close to the finish line in the primaries, and CNN, your campaign news reports, Political Ticker notably, have been many times so inaccurate and biased that I chuckle at everything. And, the same people with the same venom keep attacking Senator Clinton and her supporters to death. You and them make me feel ashamed and apprehensive to join in to support Senator Obama all the way. It shows that the Obama camp wants to win the primaries at all cost but I doubt that he will succeed at the general election without the votes from Senator Clinton's supporters. Be kinder and wiser, people. Has he been checked out for dementia. Obama can't win without her supporters–he doesn't stand a chance against McCain. I am SO sure Senator Obama would not even dream of offering the VP spot to a woman who has lied, cried and is somewhat delusional! I agree she is making strides for women , however she is NOT the first woman to run for this office & will not be the last. Hilary & her husband had their turn in the White House...I say let the remaining states vote, then they can take their toys and go home. Hilary has been planting this seed of being president since the day they left the White House, but its OBVIOUS it is NOT her time!! As far as her winning KY...there were tons of Blacks & Whites that voted for Obama. She went up in those cricks & hollers were all those inbred, possum eating, illiterates live. The only Black person most of them know is Michael Jordan. Obama would not get the vote in those places even if he put Hilary AND Bill on the ticket. I am a Black woman from Louisville, KY and racism there is STRONG!! I KNOW what I am talking about! I am proud of the Blacks AND Whites that did go out to vote for the next president of the United States of America...Barack Obama!!! I read all these comments .. its too bad that hillary supporters wont vote for barack due to the comments made by barack supporters. Look at the man himself, and what he stands for, not what other ppl that support him think. Its the principle behind barack that we should focus on. He is a legitimate person, who is different from past politicians. This is a man who came from nothing to something, a man who handily beat the clintons, a powerhouse political family. To vote for mccain, who represents a 3rd bush term – even more radical on foreign policy then bush – would be a disaster. Take a look at barack, hes a good man, that will put the US back on the world map and fix this crippled economy. Why is my comment in moderation for sooo long? Obamabots need to begin dialing back the hate speech. If they want to win in November, they are going to need every Clinton supporter they can get. Sorry Matt, I am calling BS on that. weary and frustrated? please. no. proObama? – 2008? – yes I am! but to his active supporters – stop trying to intimidate and threaten and bash. get it together. So HRC supporters will vote for McCain if things dont go their way. But what are you 'yes we can' people going to do if things dont go your way – riot? Represent Obama for God's sake. Exemplify the dignity of the man. Emulate – dont spread hate! For all the Hillary bashers...remove your emotion and do your home work. See what she has accomplished in her life and career. You might be surprised. This is not about popularity contest. This is about the future of our nation. I think Obama has good wishes, is a dreamer, has hope of change, is too young for this... but He can actually do a pretty good job... the only thing I am worried about is that he will let all the middle easterns come our way easily. Also, the VP isn't in the White House, right? Why are these people worried about Bill being back in the White House if Hillary is VP? If Hillary's smart, she wouldn't accept the VP offer if Obama made it. The reason? If he lost the general, the Hillary-bashing chatterati would–erroneously– blame her presence on the ticket for the loss. And if he won with her as his Vice President, what then? John Nance Garner was right when he said being VP wasn't worth a bucket of warm spit. Hillary would do better to remain in the Senate where she can get things done and not have to play second fiddle to an overhyped Chief Executive likely to fall flat on his face whenever the chips are down. I agree with President Carter. The Republicans would have that Obama/Clinton for lunch... because they would come out in droves to defeat Hillary Clinton. They want her on this ticket and are licking their chops right now. Oh God no don't let Hillary anywhere near the VP slot! It's high time the woman is put on permanent mute! Well folks, it's official! I am DONE with HRC supporters. I could care less if they vote in November or not. After the pathetic display of people like Geraldine Ferraro in the last few days, I am not interested in having their support. I hope that they all stay home in November. Go ahead and do it. As a member of NARAL, I dare them to STAY HOME and watch McCain repeal Roe v. Wade. Go ahead, make my day. I am tired of Obama supporters having to tip toe around as though we should be ASHAMED that our candidate WON fair and square. No more for me. I am going to GLOAT and BE THRILLED. Those former HRC supporters who want to jump on the O train, welcome. To the others, feel free to stay home in November. Your children and grandchildren will thank you for contributing to the fall of a great power by electing McCain.